CD196, also known as CCR6, is G-proteincoupled receptor (GPCR) consisting of an extracellular amino terminal, seven membrane-spanning regions and a cytoplasmic carboxyl terminal. CCR6 is a member of the beta chemokine receptor. CD196 is a 374 amino acids long protein and has a calculated molecular weight of 42 kDa.. CD196 is predominantly expressed by B lymphocytes, certain subsets of effector and memory T cells and by immature dendritic cells but not by monocytes, NK cells or granulocytes. CD196 binds CCL20, although members of the β defensin family (family of anti-bacterial peptides) also bind CD196 with a lower affinity. 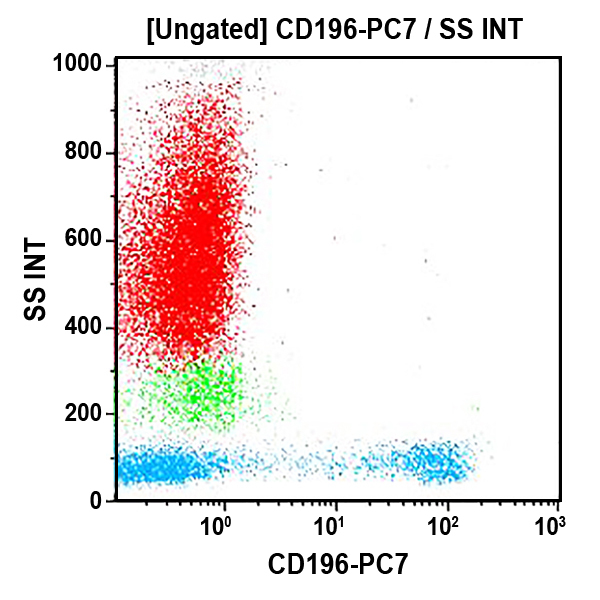 CD196 positive cells, and its ligand CCL20,have been detected in numerous organs, especially the secondary lymphoid organ. CCL20 is selectively made by the follicle-associated epithelium (FAE) overlying Peyers patches (PPs) and isolated lymphoid follicles (ILFs). CCL20 contributes to the recruitment of CCR6-expressing B cells to these structures. In humans, CCR6 can function to mediate arrest of T cells on dermal endothelial cells and is highly expressed on T cells resident in both healthy and diseased skin. CCR6 and/or CCL20 have been implicated in the pathogenesis of inflammatory joints diseases and inflammatory bowel diseases. Human T cells that are able to produce IL-17 express CCR6. It suggests that CCL20 and CCR6 have a role in inflammatory diseases by recruiting Th17 cells to target tissues. Clone Description The B-R35 monoclonal antibody specifically binds to CCR6.